Although Wrangell-St Elias is a national park of immense size – the largest of all with immense potential for exploration, perhaps none of the experiences it offers is as accessible and remarkable as exploring its Root Glacier. Find out what I discovered by spending a day wandering above and also under the ice. Of all U.S. national parks, Wrangell-St Elias provides arguably the easiest access to a glacier and the most interesting glacier to explore. You need a long hike to reach the glaciers in the continental U.S. There are only three Alaskan national parks with roads, Denali, Wrangell-St Elias, and Kenai Fjords. The Alaska Range and its glaciers are very far from the Denali park road. 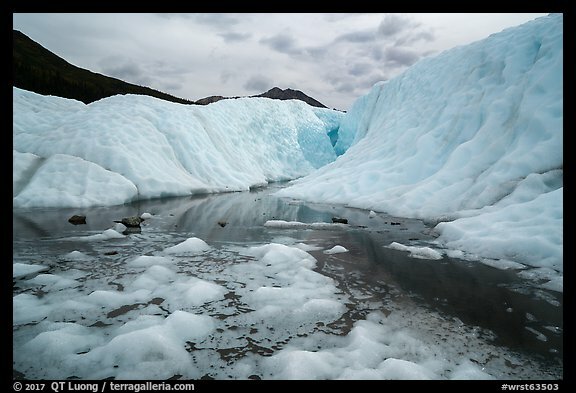 The terminus of Exit Glacier in Kenai Fjords National Park is quite close to the trailhead, but it is too steep to be explored safely, and therefore you need to hike up a trail with 1,500 feet elevation gain before approaching the glacier. By contrast, the hike from the historic mining town of Kennecott to the point where you enter the Root Glacier is less than two miles on the mostly flat and well-maintained Root Glacier Trail. 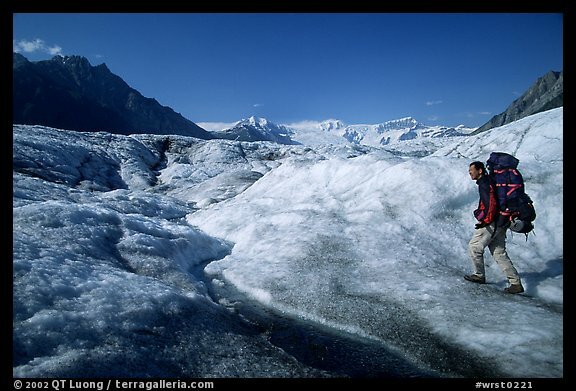 In 2000, I crossed the entire width of the Root Glacier on my way to Mt Donoho. I was carrying a big backpack (above) that included my camping gear and 5×7 camera system. This limited my agility on the glacier. Last fall, I returned to Kennecott to explore the glacier more thoroughly, and in particular to visit its glacier caves. Glacier caves, often called ice caves, are caves formed within the ice of a glacier, often by water flowing underneath the glacier. 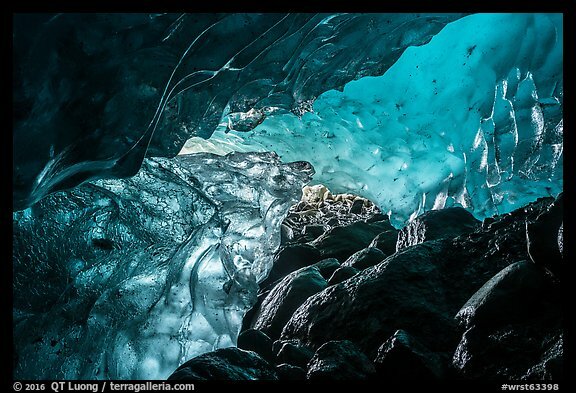 Iceland has probably the best ice caves in the world. 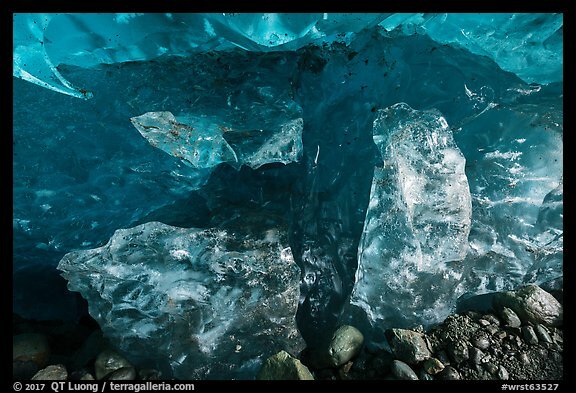 At lower latitudes, they are often unstable, like the Mt Rainier Paradise ice caves which are now mostly collapsed. 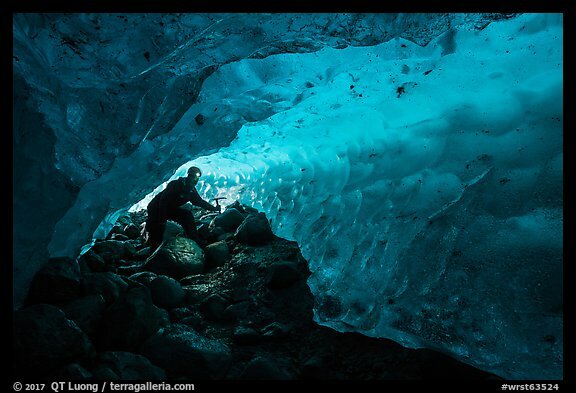 By contrast, Alaska’s latitude is northern enough to offer stable ice caves even at lower elevations. After several days in the Nabesna Area, I had just one day left to spend in Wrangell-S Elias National Park. There was no flexibility because the next day was going to be the only day of our trip without rain, and we had made arrangements for an aerial photo shoot in Kenai Fjords. With little time to poke around randomly, I thought it would be more effective to go with a local guide who would know where the ice caves are located. St Elias Alpine Guides offers a $95 ice cave trip, but their website mentioned “glacier hike required prior to booking”. Since I am a government-certified hiking guide and a technical mountaineer with some documented accomplishment, I was disappointed that they would not waive that requirement, which I found a bit questionable, since the skills needed for the ice cave exploration are different from those needed for hiking on a glacier. It turned out that you didn’t even need to wear crampons to access the ice caves, but at that time I didn’t know that, and I hadn’t packed them for this trip, hoping that some of the Kennecott outfitters would rent them – they do not for liability reasons. Since I was traveling with a friend, we ended up hiring a guide (Chris, who was excellent) for a full day private trip, at a cost of $275/person, the first time I did so in the mountains since my formative days. It was worth it. During my previous visit, I had spent a whole day on the glacier, and an additional half-day on the day back. 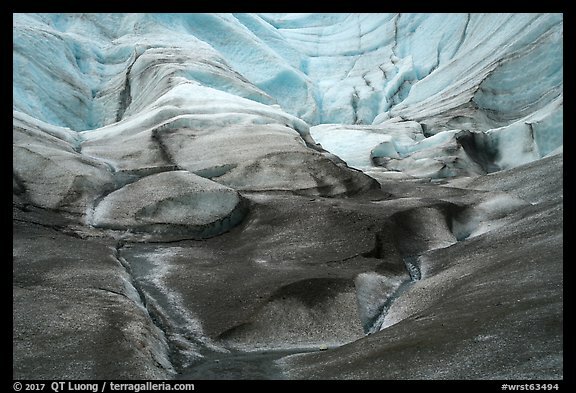 Yet, I saw some nook and crannies of the glacier that I had missed. Besides waterfalls and moulins – holes drilled at cavernous depths into the glacier by flowing meltwater, the highlight was to walk into a crevasse carved via meltwater from the bottom, an experience which reminded me of a slot canyon. Besides the fact that you are wearing crampons, the glacier hike is not more difficult than a normal hike, and you get to explore an otherworldly environment that you would not expect from looking at the glacier from a distance. 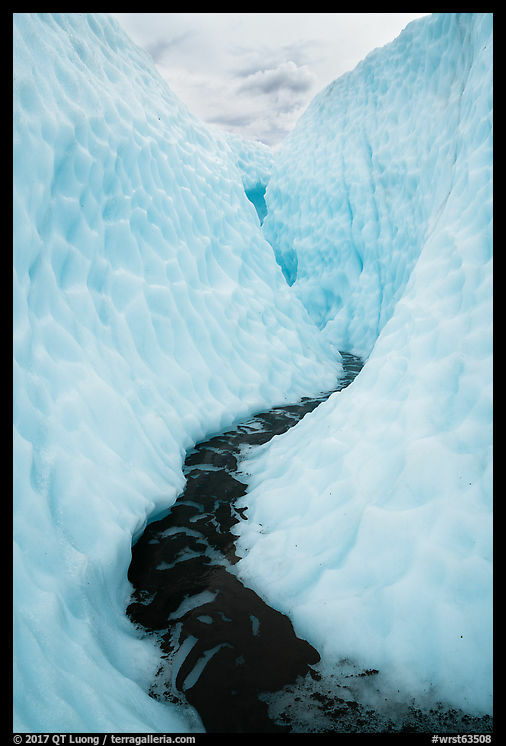 The ice caves are not located on the glacier, but rather at its edge, and the most reliable ones have been carved by Jumbo Creek, as it flows below the glacier. Jumbo Creek is the only significant creek crossed by the trail, at about 1.4 miles from the trailhead. From there, a scramble down a steep and loose user trail leads to the edge of the glacier where the ice caves are situated. 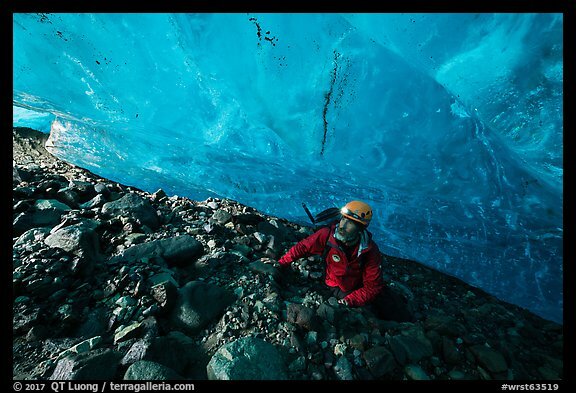 Raingear is needed, as there are sections of the cave with dripping water, and so are helmets, since rocks can fall from the surface of the glacier as you enter the cave. Once inside, the floor is quite muddy, and low ceilings require some contortions and crawling, but there is nothing that is beyond the ability of a fit hiker. 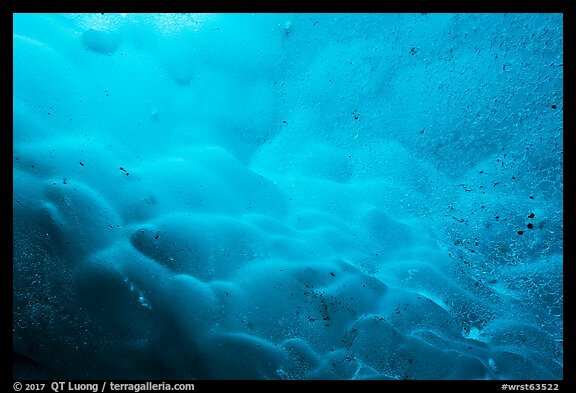 The reward is experiencing that mystic blue glow passing through the translucent walls of ice, as well as the variety of textures and patterns of the walls themselves. If you are going to photograph, due to dim light levels, don’t skip your the tripod, although it is quite awkward to deploy, and an environment quite hostile to cameras!